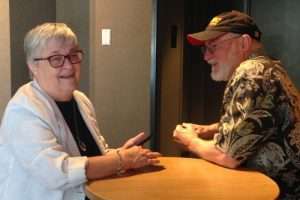 Norma Jaeger chats with Ken Rodgers at a recent producers meeting for I MARRIED THE WAR. Photo courtesy of Betty Rodgers. The team here at Syringa Cinema would like you to know a little more about our associate producer, Norma Jaeger. This insightful, enterprising and energetic woman worked shoulder to shoulder with us to introduce our previous film, BRAVO! COMMON MEN, UNCOMMON VALOR, to a national audience. Because of her passion for the mental health of our nation’s military veterans, she believed in the story’s power as a tool to understand and validate their experiences. Later, when we conceived of I MARRIED THE WAR, she jumped in with great enthusiasm because she has seen firsthand the effects of war on families after a warrior comes home from combat. Her ideas and assistance have been invaluable in developing this important documentary. We are extremely pleased to announce that Norma was recently inducted into the Stanley M. Goldstein Hall of Fame by the National Association of Drug Court Professionals in recognition of her contributions to the development of the field of drug court and other treatment courts across the United States. Named for the first drug court judge, the prestigious Goldstein Hall of Fame Award is given annually at the association’s national conference, attended by over 5,000 professionals in the drug and specialty court field. Norma Jaeger has devoted the majority of her life to public service. She has been a trailblazer in the field of behavioral health and at the forefront of countless criminal justice innovations designed to reduce recidivism and treat offenders. She led efforts to create the first Idaho veterans’ court and to expand this effort to five additional veterans’ courts. She currently provides training in the veterans’ court model across the country with the national Justice for Vets program. We could go on and on with a long list of Norma’s impressive work and accomplishments, but let us just say that we are honored and grateful to have the benefit of her support and expertise on this project. Please join us in congratulating her for this impressive award, and in thanking Norma for her commitment to our nation’s veterans and their families. Congrats Norma,I knew you were a great person. I just didn’t know how more AWESOME you were. Congratulations Norma! No one deserves it more! You are amazing my friend!